The TomTom GPS Car Window Suction Cup Mount is a windshield mount for various tomtom GO series GPS models which features a ball mount to swivel the GPS when mounted to the window and have the GPS face while driving and to suction to window, simply push the mount to windshield. It is very easy to add or remove from windshield, and even easier to insert or take off the GPS. The TomTom Windshield Mount for GO Series has many exciting features for users of all types. You can extend the lifetime of your TomTom Windshield Mount for GO Series with the purchase of a FactoryOutletStore Factory Protection Plan. 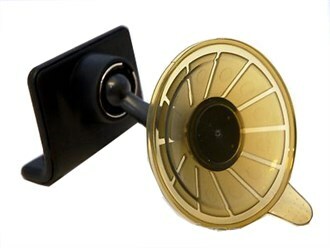 See the TomTom Windshield Mount for GO Series gallery images above for more product views. The TomTom Windshield Mount for GO Series is sold as a Brand New Unopened Item.